Purified human von Willebrand factor. Purified IgG was prepared from serum by ion exchange chromatography. Our Abpromise guarantee covers the use of ab11713 in the following tested applications. 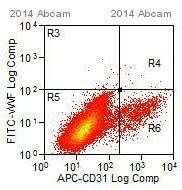 ab37385 - Sheep polyclonal IgG, is suitable for use as an isotype control with this antibody. Immunohistochemistry (Frozen sections) - Anti-Von Willebrand Factor antibody (ab11713)This image is courtesy of an anonymous abreview. ab11713 at a 1/1000 dilution staining Von Willebrand Factor in mouse blood vessels by Immunohistochemistry (frozen sections) incubated for 16 hours at 4°C. PFA fixed. Permeabilized with 0.1% Triton. Blocked using 20% serum for 1 hour at 19°C. Secondary used at 1/200 polyclonal Donkey anti-sheep conjugated to Alexa Fluor 647 (pink). Counterstain (blue) DAPI. 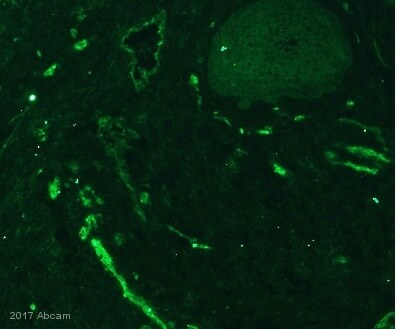 Immunohistochemistry (Frozen sections) - Anti-Von Willebrand Factor antibody (ab11713)Image courtesy of an anonymous Abreview. ab11713 staining Von Willebrand Factor in porcine heart tissue by Immunohistochemistry (Frozen sections). Tissue was fixed in acetone, permeabilized using 0.3% Triton/PBS, blocked with 10% serum for 30 minutes at 22°C and then incubated with ab11713 at a 1/50 dilution for 16 hours at 4°C. 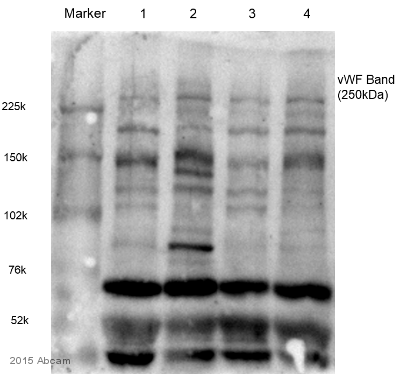 The secondary used was a FITC conjugated donkey anti-sheep polyclonal used at a 1/1000 dilution. Publishing research using ab11713? Please let us know so that we can cite the reference in this datasheet. 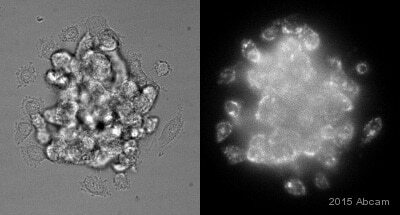 Cell harvesting/tissue preparation method: Wilson L, Fathke C, Isik F. Tissue dispersion and flow cytometry for the cellular analysis of wound healing. BioTechniques 2002: 32: 548-551. 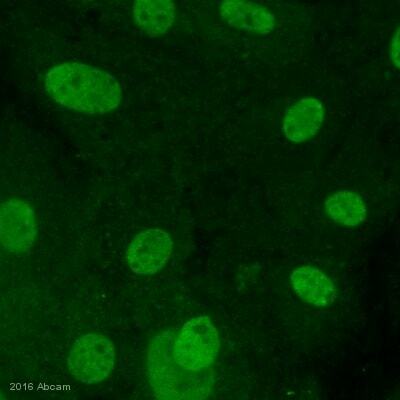 Do you know whether this antibody recognizes chick/Avian vascular tissues? I ran an alignment of the human and chicken VWF protein sequence, and there is only 56.1% homology between the two. Our AbTrial program, which allows researchers to test our products in untested species and receive the dollar amount equivalent to the antibody off of a future purchase upon submission of an abreview is only applicable for species that have the target protein with >85% homology with the target protein that the antibody was raised against. Thus, since the homology is only 56.1% I would not expect ab11713 to recognize chicken VWF. What is the concentration of the lot that I have? Thank you very much for your call today and for your patience while I've been in touch with the production lab regarding your enquiry. The IgG concentration of this lot is 9.13 mg/ml. I hope that this information will be useful, but if you have further questions or if there is anything else that we can do for you, please let me know and I'll be happy to help.